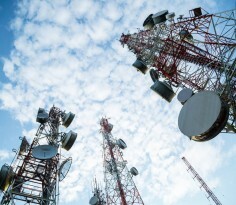 Singapore Telecommunications Nears Two-Year Low, Will It Go Lower? Singapore Telecommunications (Singtel) has breached below $3.50 on February 2018 on increased volume, the lowest close since 4 February 2016. Will Singtel go lower? Singtel has breached below its trading range $3.57 – 3.65 established during 18 December 2017 to 30 January 2018, on 31 January 2018. Volume has accompanied the fall by surging for the past four days and the volume of shares transacted for the past three days hit a daily volume of 49 to 51 million shares per day. This is the highest daily volume transacted for the past eight months. 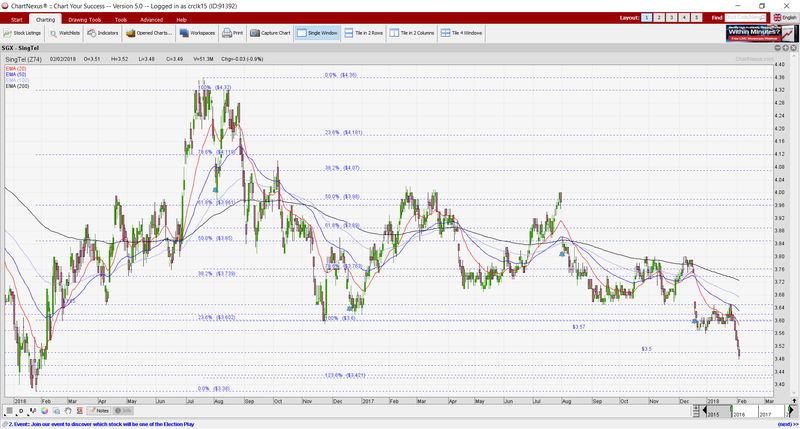 The break at $3.57 points to a measured technical target of $3.48 which should be easily attained. 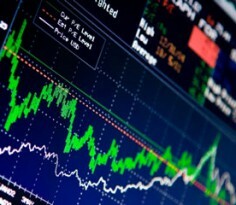 Indicators such as OBV is at a three-year low. Amid negatively placed directional indicators, ADX has started to rise from 23.0 on 29 Jan 2018 to close 28.4 on 2 February 2018. All the exponential moving averages (EMA) such as 20D, 50D, 100D and 200D are diverging and trending downwards. In a nutshell, it seems to indicate that the downward trend is strengthening. Singtel’s RSI closed at 28.1. Although the current level can be considered as oversold, it is noteworthy that the lowest RSI that Singtel went to was around 16.2. Besides the weak chart, there are some noteworthy points which may serve as headwinds for Singtel at least in the short term. It is noteworthy that US 10-year treasury yields have soared from 2.46 percent at the start of the year to close at 2.84 percent last Friday. This is the fastest appreciation since November 2016. Furthermore, at 2.84 percent, U.S. 10-year treasury yields have reached a four year high. How does this affect Singtel? 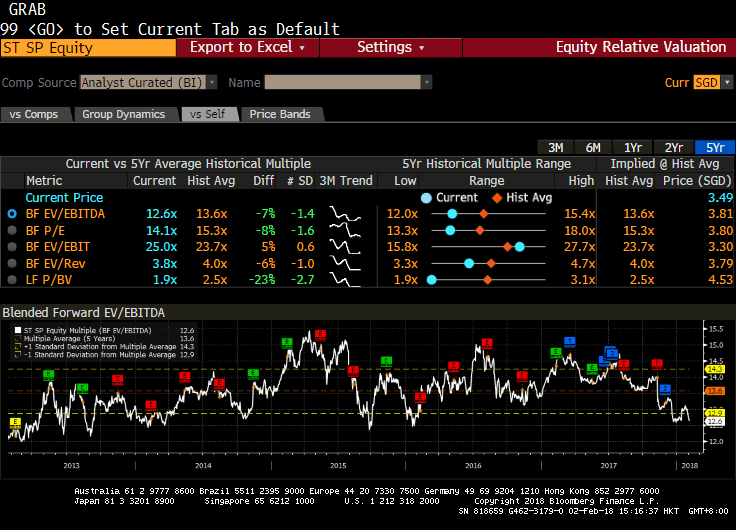 Generally speaking, the rise in U.S. 10-year treasury yields reduce the attractiveness of dividend yielding stocks such as REITs and telecom stocks. For example, based on Table 1 below, both FTSE ST REIT and FTSE ST Telecom have slumped at least 3 percent for the past one week. Many brokerage houses have maintained their neutral outlook on telecom for 2018, citing rising competition and potential earnings slowdown. In a 12 January 2018 report, UOB Kayhian has downgraded our Singapore telecom sector to market weight (while maintaining a buy call on Singtel). Singtel reports 3QFY18F results on 8 February, before market opens. The investment community is likely to scrutinise Singtel’s results and its prospects. A weaker than expected results or outlook may worsen the sentiment on Singtel (at least) in the short term. Based on Figure 1 below, Singtel is trading at 12.6 times EV / EBITDA. 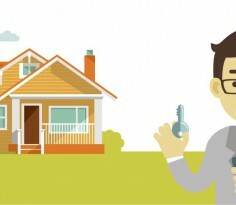 This is below its five-year historical average of 13.6times and just above its five-year low of 12.0 times. 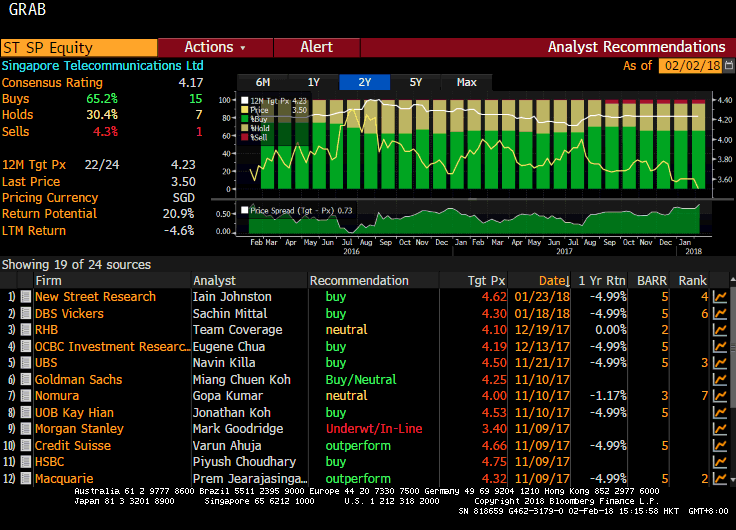 Although most brokerage houses are neutral on our telecom sector, most analysts are still ascribing a buy call on Singtel with an average analyst target price of $4.23. (See Figure 2 below). However, it is noteworthy that analysts’ target prices may change post-3Q18 results. The above write-up mainly focuses on Singtel’s chart, coupled with some points which I have highlighted that I think may be interesting to readers. In conclusion, Singtel’s chart seems weak, especially when the selling is accompanied with higher than average volume. Nevertheless, a stronger than expected set of results, coupled with strong guidance may be able to counteract the selling pressure. Watch out for its results on 8 Feb 2018. P.S: Do note that as I am a full time remisier, I can change my equity allocation / trading views fast to capitalize on the markets’ movements.